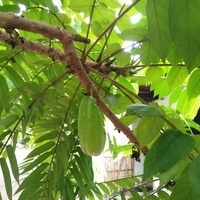 Bilimbi is a fruiting tree originating from humid tropical forests in Malaysia and Indonesia. Nowadays, it is found cultivated in neighbouring countries such as Thailand, Singapore, the Philippines, Myanmar (Burma), Sri Lanka and India. It is also common where populations of Indians and Sri Lankans have migrated and settled, such as Fiji, parts of Africa and the Caribbean. The tree may reach heights of up to 18 m (60 ft), though is more commonly 5 to 10 m (16 to 32 feet) tall with a short trunk and wide-spreading branches forming a rounded crown. The bark is brownish-pink and smooth on young trees, becoming grey and flaking on older trees. The leaves are large, 30 to 60 cm (12 to 24 in) long and feather-like, being made up of up to thirty-five oblong-pointed, medium-green leaflets, arranged in pairs opposite along the length and with an extra leaflet at the tip. They are evergreen, and so remain on the tree in all seasons. The flowers are five-petaled, crimson-red, 2.5 cm (1 in) long and almost as wide, held in long clusters that are borne directly on the trunk and branches. They bloom almost year-round but tend to be more abundant in the dry season and are succeeded by unusual cucumber-like fruit, which appear even more curious hanging down in clusters from the trunk. The cucumber-shaped fruit are 2 to 9 cm (2 to 3.5 in) long, firm, faintly ribbed, with thin, smooth glossy green skin, becoming pale yellow and soft when ripe. The pulp is juicy, crisp when unripe, jelly-like when ripe and with either no seed or a few flat, pale seed. The fruit pulp is high in ascorbic acid, which makes it very sour and it is not usually eaten fresh, though there are reports of an uncommon variety with only moderately sour pulp. 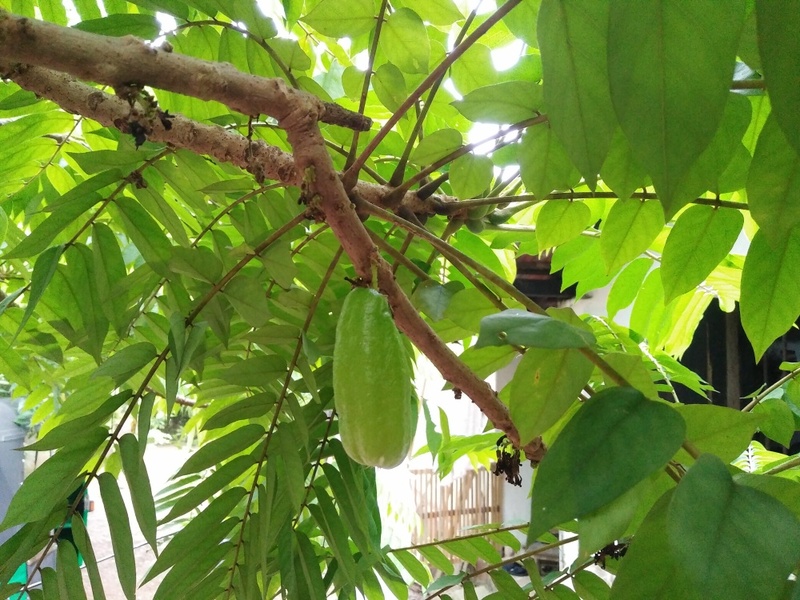 They are usually either dried, candied, preserved in syrup, made into jelly, relishes or pickles and make an excellent substitute for green mango in chutneys. They also yield a juice that is used as a souring agent in cooking and to flavour cooling beverages. The acid pulp can also be used as a stain remover on clothes and to polish brass and silver. The leaves are made into a paste or poultice used against skin inflammations, including itchy skin and skin eruptions generally. A cough syrup is made from the fruit. Grows naturally in moderately humid to humid subtropical and tropical lowland climates, generally in frost-free areas with annual lows of 17 to 25 °C, annual highs of 26 to 35 °C, annual rainfall of 1400 to 4000 mm and a dry season of 5 months or less. New plants can be raised from seed, but are mostly propagated from cuttings and using air-layering (circumposing) techniques, because seed-grown trees do not always inherit the characteristics of the parent. Preforms best on rich, free-draining loam and sand soils of a moderately acid to slightly alkaline nature, generally with a pH of 5.5 to 7.5 and on sites with full to partial sun exposure. It has good tolerance to limestone soils, but poor tolerance to shade conditions. It is listed as a weed in at least one reference publication, however, there does not appear to be any record of it anywhere as a serious weed. It is assessed as a low weed risk species for Hawaii, by the Hawaii Pacific Weed Risk Assessment project (HPWRA). This fruit have a high oxalic acid content which may adversely affect kidney function in some and the ascorbic acid in the pulp can cause gastric irritation if ingested in large quantities.